Disney Babies Blog: Planning like a Pro! 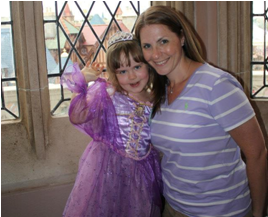 Please welcome Rebecca to Disney Babies Blog! A Pittsburgh, PA native, she has been living and working the New York City metro area since 1999. An Auntie to five nieces and nephews and an experienced Disney traveler, she planned a trip for our extended family with great success in the fall of 2012. With bigger plans in 2013, she and her husband hope to experience another Disney Cruise and visit Disneyland for the first time. 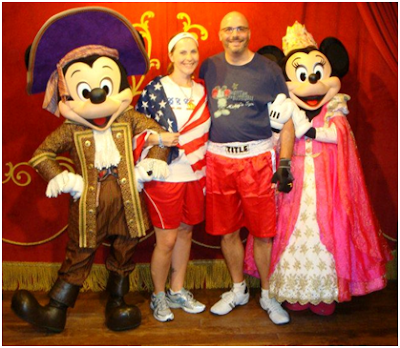 Rebecca and her hubby were Olympians for Mickey's Not So Scary in 2012! In early 2006, my (now) husband and I were planning a vacation to celebrate my 30th birthday. We had a budget in mind and really wanted to get the most for our money. The travel agent sent us price quotes for all-inclusive resorts in the Caribbean and Bahamas, but we’re not drinkers or into nightlife, so it wasn’t for us. One day, out of the blue, the hubby says, “Why don’t you ask the travel agent to do a Disney price quote?” And I thought, HA! What a joke. We’ll never be able to afford it and I’m not at all that interested. I hadn’t been to Disney since I was a teenager; although my family had visited several times over the years…my memories were limited to pictures. When people ask me why we’ve gone back to Disney so many times, I tell them that for us, it’s all about return on investment (ROI) – and I know that sounds clinical and cold, but it’s not. For each and every trip, we get OUT of the vacation a million times more than the money and planning that goes into it. I will caveat this by saying that I plan events for a living, so planning a vacation comes very naturally to me. Creating spreadsheets and researching park hours is NOT for everyone! A lot of people are also surprised when we tell them that we became fans of Disney without children of our own (yet). There’s so much you can do, just the two of you! Enjoy fine dining at California Grill atop the Contemporary Resort, check out the live music and traditional Irish dancing at Raglan Road in Downtown Disney, hit the biggest and scariest water slides at Blizzard Beach. My favorite perk has been the Cast Members who are often looking for a party of two to fill a ride vehicle, allowing us to jump the line dozens of times. And you’d be surprised how many OTHER “couples” are there at WDW doing the same thing you’re doing – have the time of their lives! 1. Your homework. Disney isn’t a place where you can just “show up” and expect to get into the best restaurants or other experiences. If you’re not a planner, use a travel agent. He or she will make the plans for you (see tip #3). 2. Structure your vacation to suit your personality. Not a morning person? Take advantage of evening park hours and avoid morning rope drop. Can’t stand the heat? Visit the parks in March or April. 3. Use a travel agent! Their services are free and they can do most of the hard work for you. 4. Treat yourself…book a spa appointment, a late-night dinner somewhere posh, a deluxe resort. Especially if you see starting a family in your future, you’ll be glad you got to experience the best of Disney without having to cut someone’s pancakes for them. 1. Try to do it all in one trip. You will just end up tired and disappointed. In all of our trips, we STILL have not done everything! 2. Blow off making dining reservations – you’ll miss out on great food! 3. Expect to pay Wal-Mart prices. This is Disney, and it’s not cheap. 4. Expect your friends or even family members to understand why you’re choosing a Disney vacation. It’s your time off and your hard-earned money! Deluxe resort – Polynesian, much more character than the Grand Floridian. Ask for the Rapa Nui longhouse for easy access to the Transportation and Ticket Center. Moderate resort – Port Orleans French Quarter. Great feel and theme, small overall resort size. Ask for a top floor, corner room in building 1, 2 or 3 for easy access to the food court, pool and bus stop. Boma at Animal Kingdom Lodge for breakfast AND dinner. We’d eat there EVERY MEAL if we could, it’s THAT GOOD. Kona Café in the Polynesian for any meal. 50s Primetime Café (Hollywood Studios). Another note about restaurants: We have never had a bad meal at Disney. Never. The BEST meal we ever had was on my birthday at California Grill, located on the top floor of the Contemporary Resort. The service, the food, the view, the experience were all AMAZING. Second favorite, Palo on board the Disney Dream. Hubby says that he likes it all so much, he can’t rank it. “I like all of it!” he said. with her niece at Cinderella's Royal Table! Overall, we’ve never had a bad time at Disney. I’m constantly flabbergasted by the number of people who say they hate it; it’s not for them, etc. On our most recent stays, I noticed multiple irate guests at the front desks of the hotels voicing their complaints. Now, I’m really sensitive to that kind of thing, as I hate to see it happen. But, I really wonder WHAT on earth those people could be so upset about at a place as wonderful as Disney. To contact Rebecca, find her on twitter @RMZFarrell or email her mrsfarrellhob@gmail.com. Look for more of Rebecca's planning posts coming soon! Rebecca, I love your ROI and totally agree with it. I have been on vacations to other places but keep returning to Disney World. Most recently, November 2012, I went for 9 nights by myself. It was an awesome trip, a lot slower than usual and I got to do the things I love more than once! I stayed at my favourite - Pop Century. I too have over heard people complaining at Guest Services or the hotel and what I have heard seems to be them complaining because no one 'told' them they had to book restaurants/tours in advance. Complaining about their own lack of planning seems a bit silly to me. I completely agree that Disney is all about the planning. It is wonderful to walk into vacation and have it planned. I am running Tinkerbell Half Marathon one month from today and Wine and Dine Half marathon in 2013 and I enjoy the planning process for sure. Our January trip is planned and now it is onto planning November! Whoop whoop. Congrats on running those races! What a fantastic accomplishment! Right?! I mean, the bookshelves (hard copy AND electronic) are filled to the BRIM with planning guides for Disney vacations. Glad you liked it!